This online video webinar will increase your skills, knowledge, and the fun-factor so your training is a snap! 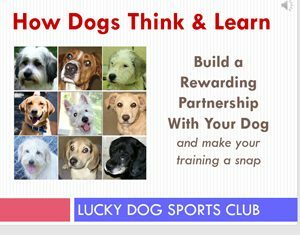 Build a Rewarding Partnership With Your Dog and make your training a snap! Good trainers understand how dogs think and the best ways to teach them. To become more effective and efficient training your dog, we are going to share important training and behavior tips and tricks. This hour-long video will make your training easier and more fun. In this video you will be taught the skills and concepts needed to better understand your dog, build better attention and focus, and change annoying behavior problems. Our goal is to help make life with your dog easier and more enjoyable. This video provides you with the low-stress training tools to begin to do that in easy to understand explanations, photos and video lessons. Enjoy the included lessons to begin building your dog’s skills!